Black Diamond Cyborg is a high-end crampon for ice and mixed climbing -- now with a lighter-weight, re-engineered design using stainless steel. 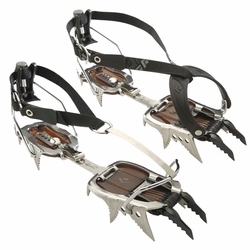 From vertical ice routes in Switzerland to hard alpine mixed routes in the Canadian Rockies, the Black Diamond Cyborg crampon is our high-end ice and mixed climbing crampon. Built with a semi-rigid stainless steel construction, the Cyborg's versatile design can be converted from dual- to mono-point, and the hooded vertical frontpoints provide solid bite on everything from tenuous ice blobs to horizontal rock edges. The Cyborg's light and durable stainless steel design won't rust, resists snow balling and is free from toxic coatings that wear off in the mountains.